A first-half James Hammond goal helped Lewes to a hard-fought 1-0 win against Leatherhead in atrocious conditions at the Pan, reports Tom Harper. Darren Freeman made two changes to the side that narrowly lost 3-2 at National League South side Hemel Hempstead Town in the FA Trophy on Tuesday, with Stacey Freeman and Kieron Pamment replacing Luke Blewden and Sam Karl in the starting line-up. These changes saw the Rooks play three at the back, with Freeman lining up alongside Frankie Chappell and Tom Day at centre-back, and Steve Brinkhurst and Henri Wilder playing in the wing-back positions. The conditions made it tough for either side to play free-flowing football early on, and there were few chances of note during the opening stages. The opportunities that were being created were falling to Leatherhead though, who saw Jeremiah Amoo shoot wide after being played in by Shaun Okojie, before William Salmon forced a smart reaction save from Lewis Carey with a near-post effort from a Travis Gregory corner just minutes later. Lewes were being restricted to long-range efforts for much of the half, and saw James Hammond test Zaki Oualah with a 30-yard free-kick that the visiting goalkeeper did well to push away from danger. The Rooks took the lead in slightly fortunate cricumstances after 41 minutes, as Oualah inexplicably dropped a Kieron Pamment corner at the feet of Hammond under a challenge from his own defender William Seager, with Hammond just about forcing the ball over the line despite the best efforts of another covering defender to hook the ball clear. Parts of the pitch were very nearly unplayable at the end of the first half and start of the second, with the ball holding up in the centre circle and on the edge of both penalty areas. This made for little goalmouth action for much of the second half, which suited Lewes and enabled the Rooks to hold onto their lead relatively comfortably. 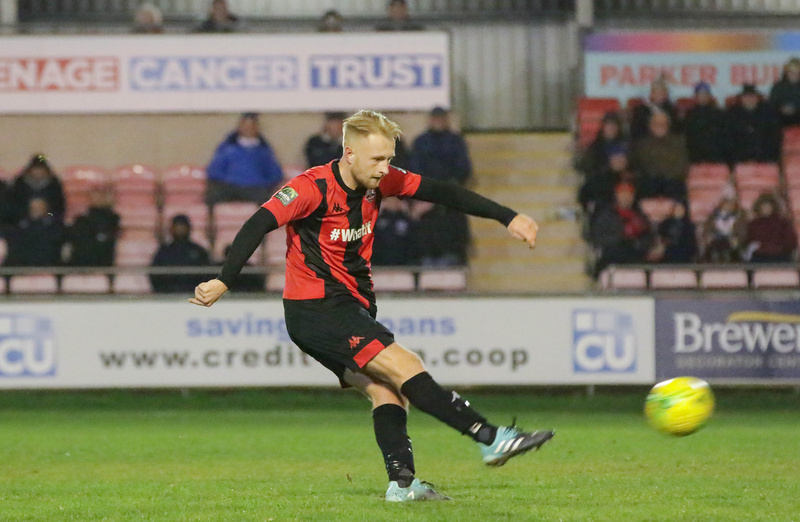 The work rate of the Lewes players throughout the second period was exceptional, with every player doing their bit and ensuring that Carey remained largely untested as the game headed into injury-time. At this point, Leatherhead unsurprisingly started taking more risks in a bid to score a late equaliser. They had a good chance to do so when the ball fell to Okojie in the area, but he saw his close-range effort superbly blocked and deflected over the bar by Day. From the resulting corner, a towering Jerry Nnamani header was headed off the line by Henri Wilder, with the goal-bound effort on the rebound being acrobatically blocked by Hammond before Lewes were eventually able to get the ball clear. The Rooks saw out the remaining minutes of injury-time more comfortably to record an impressive victory over one of the league's form teams heading into the game, and move to within one point of the play-off places. Darren was full of praise for the defensive performance and the grounds staff when he spoke to Barry Collins post-match. You can read the E-Prog from the game here. Lewes will hope to build on this result when they welcome Corinthian Casuals to the Pan on Wednesday, kick-off at 7.45pm. Lewes: Carey, Brinkhurst, Wilder, Day, Chappell, Freeman, Dome-Bemwin, Hammond, Smith (Elliott 62), Pamment (Reed 90), Lawson. Unused Subs: Golding, Blewden, Karl. Leatherhead: Oualah, Salmon, Seager (Blake 80), Ikebuasi, Wassmer, Nnamani, Theobalds, Gregory, Okojie, Olutade, Amoo (Cullen 85).